Long before I started making ATC's I enjoyed doing what is called digital art. Since they really aren't considered suitable for ATC's, unless there is a swap themed especially for them, I decided to share a few of mine. I made this for a friend when her beloved Westie passed away. I pulled him from a photo that I had of him walking down a sidewalk. Then I found a picture of this wooden bridge that was taken in a national park and published on their website. I added the rainbow colored glow to the bridge picture. 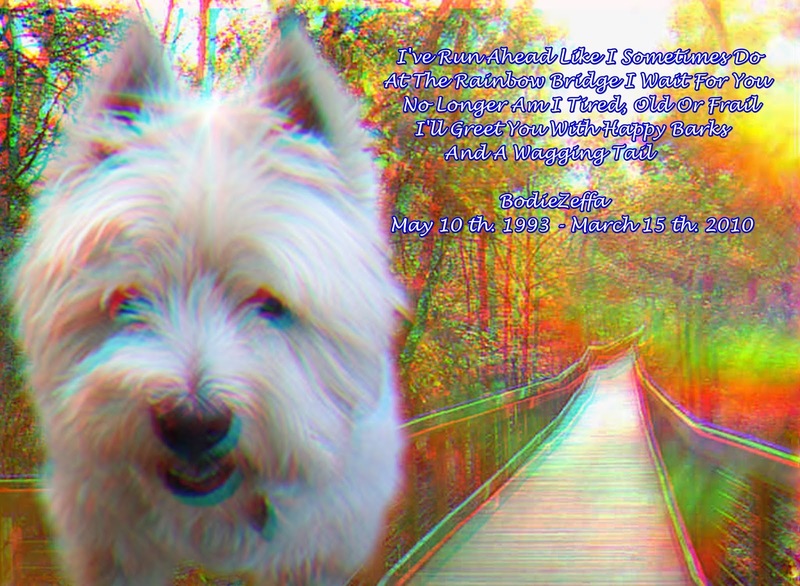 Then I put Bodie in front of the rainbow bridge picture that I had made. I then wrote the poem and placed in the right corner. Needless to say it made her cry, but she thanked me for memorial keepsake of her precious boy. Most of you don't know that my little princess is a rescue dog. 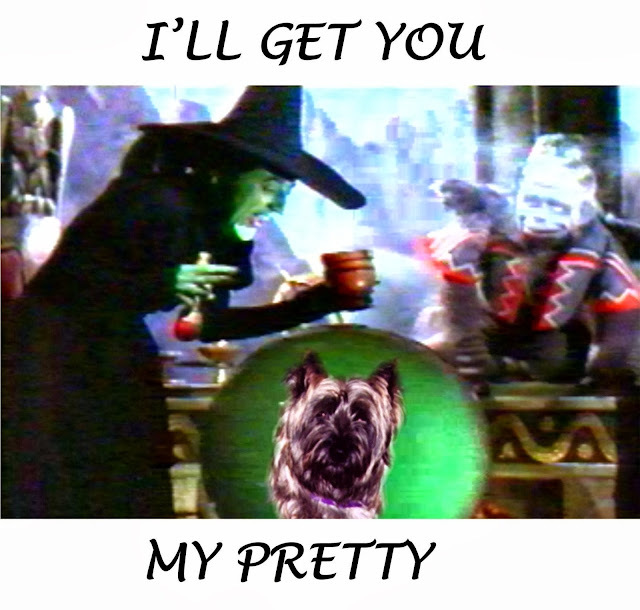 Yup, I rescued her from Col. Potter Cairn Rescue. It was just before Christmas. It was the first day of my little blonde girls life, and one of happiest days of mine. Col. Potter never gives AKC papers to the new owner. These kids are given a new name and identity...kind of like a government protection plan. So I applied to the AKC for Independent Listing Privileges which means that she can't be shown but she can do other events, like agility. This was a special day in her life so I made her a formal for the event. I then made Skeeter my little prince formal attire. 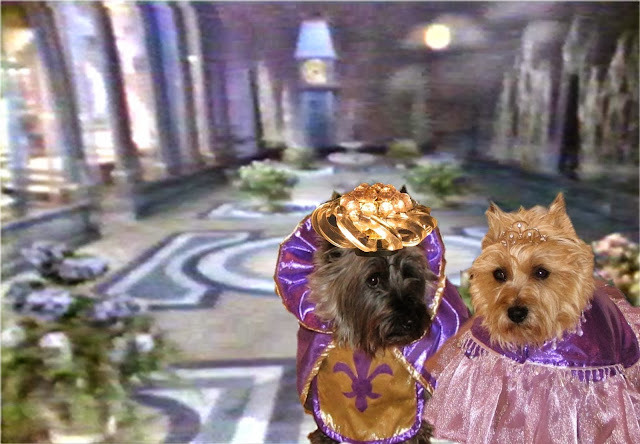 I pulled the Cinderella background in this picture from a VHS tape of the musical of "Cinderella". I must have made several hundred screenshots of this before I captured one suitable to use. It took hours and hours. Then I took about a hundred photos of the two of them together before I had one that I liked. I removed their background and placed them in front of the ballroom picture. Skeeter didn't have a crown so I took a picture of my ceiling fan light and removed it from that picture and turned it upside down on his head in this picture. Putting this all together must have taken at least a hundred hours. It has never taken that long to make any other art project. This picture was made the same way as the Cinderella picture. The background was pulled from a very old and worn "Wizard of Oz" VHS tape. I love "Oz" and have worn that tape right out. A couple hundred screen captures sure didn't help any either. I couldn't help myself. 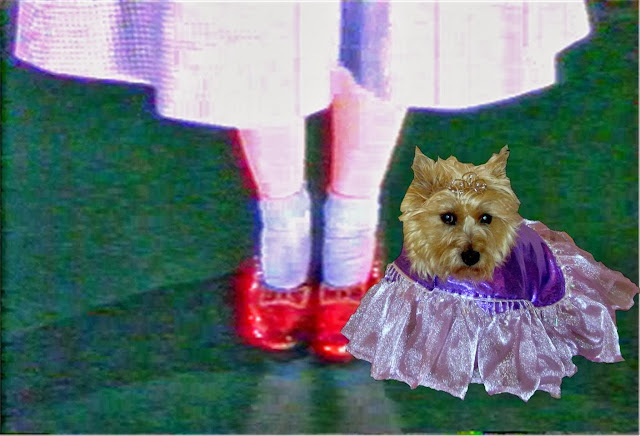 I had to put Skeeter in Oz, too. I made a shirt out of this. Sadly those iron on t-shirt transfers don't last very long. This little girl started her new life at a rescue intake center that my husband and I built and ran. Her adoptive family named her Skye. Shortly after she was adopted she ran away. Many people spent many weeks searching for her. She was eventually found dead. My husband and I gathered the rocks from all over the property and built a rock cairn for her as a memorial. We placed a solar candle on top. 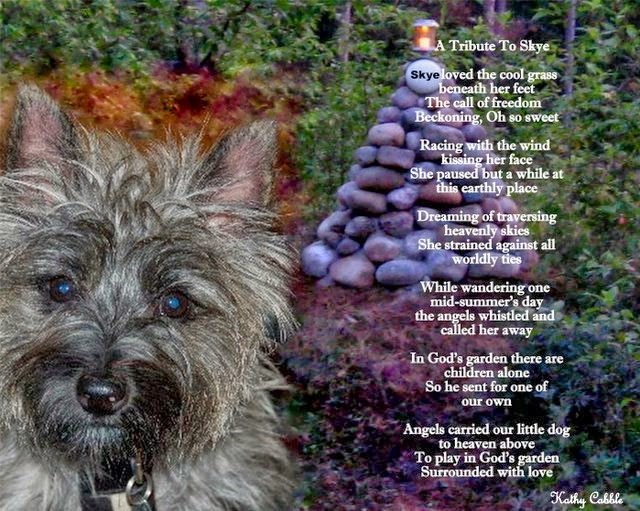 I took pictures of the rock cairn and then I found a picture of Chastity and pulled her from that picture and placed her in front of her memorial. I then wrote the poem and laid it over the the rock cairn. Although this isn't the paper and paint art that I usually feature on my blog I wanted to take the time to honor those that work endless hours working on digital art. It is art, yet sadly most art swaps won't allow it to be used. What a lovely memorial to those that you have loved and lost. I considered what you did to be art in its highest form! I wish I knew your email address, I would send a picture of a card I did for my babies.